What Should Your Family Look for in an Animal Behavior Clinic? When it comes to health problems in your pets, it is obvious that you should visit with a vet, but what are you supposed to do when your pet’s problems are behavioral? Unfortunately, not every veterinarian or animal trainer is experienced in handling behavioral issues—especially extreme behavioral issues such as aggression and anxiety. In some cases, you will need professional help from trained specialists at an animal behavior clinic, but how do you know which ones can truly help your pet learn to better deal with major behavioral problems such as anxiety and aggression? What do you need to look for when it comes to finding a place to get both you and your pet help? One mistake that many people make when seeking help for their pet’s severe behavioral problems is that they don’t find someone with the appropriate training or credentials. For these types of problems, you want to visit a veterinary behaviorist, because they have specialized knowledge and training on how to approach the issues. AERA advises that pet owners seeking behavior help for their pets should look for a veterinarian’s clinic that offers animal behavior services or an animal behavior clinic that employs veterinary behaviorists. A veterinary behaviorist has advanced knowledge of and extensive training on the behavior of companion animals, which ends up being beneficial for owners of pets with problems like aggression and anxiety as well as those who need help with basic training needs. When it comes time to meet with a behaviorist, the best thing you can do is show up prepared. Most veterinary behaviorists will send you history forms to be filled out prior to the consult. A veterinary behaviorist will need to know everything you can give him or her about the behavior your pet is exhibiting and when your pet displays said behavior. The behaviorist will try to determine the cause of the behavior and come up with a solution to improve the behavior. 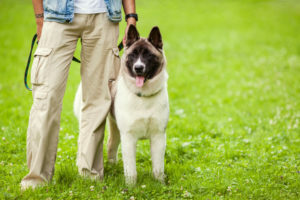 Once the behaviorist has determined the cause of the undesirable behaviors, he or she can go over various options on how to start working with your pet There is no one-size-fits-all solution to behavioral problems, and oftentimes, the behaviorist will employ numerous techniques to try to help you and your pet. If one method doesn’t show improvement, the behaviorist will be right there to help you find something that does. The Animal Behavior Clinic of AERA has a team of experienced professionals who help both pets and their owners cope with and change unwanted behaviors. Emily Levine, DVM, DACVB, is the Animal Behavior Clinic’s board-certified veterinary behaviorist and an expert in all things animal behavior. Dr. Levine not only works closely with pets and their owners, but she also authors papers about animal behavior for veterinary journals and textbooks. Basic dog training: The Animal Behavior Clinic of AERA doesn’t only work with animals that have behavioral problems. Basic training for dogs is also available at the clinic, as well as nose work lessons, games, and body language training. Basic cat training: Cats can be trained, too! Experienced trainers can teach your cat basic commands and manners. Crate and travel training: Our pets don’t always enjoy travel as much as we do. When it comes time to load up the car for a trip, it will make your life easier if your pet cooperates. It is equally important that your cat or dog is crate trained, so you can feel comfortable leaving your pet home alone on a daily basis. New pet preparations: Get help from the Animal Behavior Clinic of AERA before bringing a new pet into your household. Not only will the team be able to help you understand what you will need to be fully prepared, he or she can also help you make introductions between the new pet and children or existing pets. New child preparations: Having a baby is a joyous time. Let the Animal Behavior Clinic of AERA help you acclimate your pet to a new baby. Puppy and kitten raising help: Puppies and kittens are fun and adorable and if you want to get off on the right paw so to speak, schedule a private session with our trainer or technician for all the information you need to know to raise a behaviorally healthy puppy or kitten. For puppies, this type of appointment is a great adjunct to any puppy class you may be enrolled in. For kittens, this is a must because there a very few education opportunities for new kitten owners out there. These can be held remotely as well since we know there are not many other options out there. Grooming and healthcare help: If your pet hates visiting the groomer, the Animal Behavior Clinic of AERA can help familiarize your pet with the routine grooming practices that they will be faced with. They can also implement techniques to help your pet become more comfortable while at the veterinarian. Fear Free veterinary care: In addition to helping your pet feel more comfortable at the veterinarian’s clinic, many members of AERA’s staff are Fear Free-certified. This type of training helps veterinarians provide low-stress veterinary care to help keep animals calm during visits. If you live in the Fairfield, New Jersey, area and you need help dealing with your pet’s behavioral issues or any training, contact the Animal Behavior Clinic of AERA for help. Dr. Levine and her team can help your pet who may have complex behavioral problems with a variety of advanced and proven techniques. They can also work with new puppies and kittens to help prevent serious problems from developing down the line. To set up an appointment at the Animal Behavior Clinic of AERA, call 862-702-3738.